Site-specificity permeates your work along with a continued investigation of ‘sculptural architecture’ and relationships between space and experience. For your installation at Bad Reputation, a space many would find challenging, did you see the spatial dynamics— it’s location in a hybridized medical building with one complete elongated wall and a corner expanse of windows, for example— as challenges that limited the scope of your vision or as essential precursors that informed your use and activation? 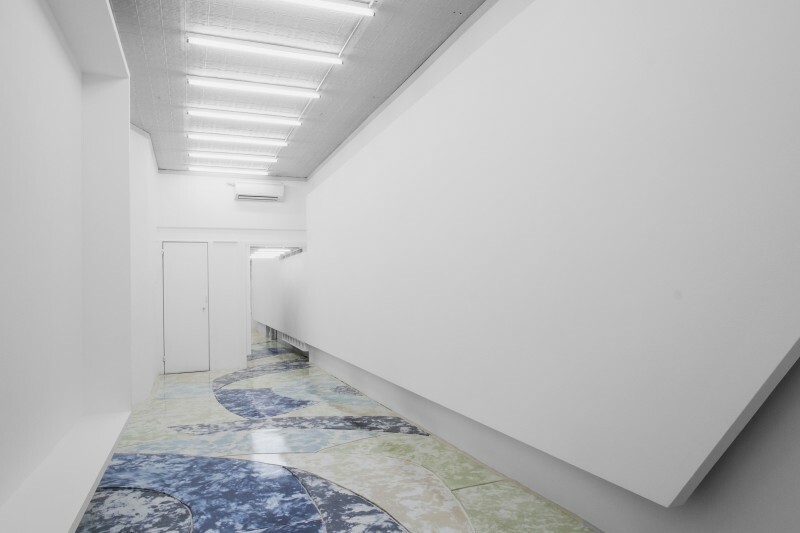 The gallery’s characteristics are indeed very constitutive, dramatic and theatrical, calm and minimal at the same time. One can’t work around the striking panorama with the sunset as background— the limitation of space is directing the scale of anything in there— even when it’s empty you have this strange feeling of claustrophobia and ultimate freedom at the same time. The every day life of the medical center— an unbeatable contrast to an art gallery— and the neighborhood around MacArthur Park, resemble this in a way: this historically and socially charged area, a place many are stranded after finding their way to the US, ruled by gangs and immigration dilemma. Unlike most of LA too, people hang in the streets, the area is so busy and you instantly think how we all walk around and try to make the best out of our situation, how our reality wafts somewhere between constriction and potential. I wanted to realize this work for a while, but no place felt right for it. It’s political dimensions seemed to flatten when presented in a white cube, for example. The windows of Bad Reputation of course highlight the work’s lyrical formalism. The small extent makes it easy to accomplish the work’s circuit… In New York, I totally blended out and forgot how LA is full of fences— every house, almost every building, is surrounded by a metal grid. They intimidated me in the beginning when I was driving to the welder in East LA, a specialist of course for fences. Ironic. Like fencing in general: decorative defense, friendly ways to say ‘stop’ or ‘not further,’ with pretty spearheads, ‘look but don’t touch,’ etc. The discrepancy of outside and inside is something I consider very negotiable, even when it’s made of steel. Like your recent solo show in New York, Opus Sectile at Ludlow 38, the title sets the scene for the realm we step into. We enter a song and oscillating formation; a gestural space that seems to be a frame frozen in memory and time. What parallels do you see between these two shows, if any? Can you talk about the title? ‘Convenience and melancholy’ seems to sum up living in LA quite perfectly… is this a localized hymn to the city? The floor piece at Ludlow 38 and the fences at Bad Reputation were tailored onto their surrounding architectures. Usually we highlight a space’s potential and try to erase the defects in order to present works in the most advantageous way. It’s very liberating not to give a damn and stress about the opposite… Ludlow 38 is like a tube, stretched and narrow, with many ankles, you can see the exhibition in every corner— most striking through a giant permanent wall installation by Martin Beck. The concrete floor’s pattern was designed as if it was a fragment of a much bigger space, a size almost impossible given New York’s LES real estate limits. When Vivien Trommer— the curator of this year’s curatorial residency at Mini/Goethe-Institut Ludlow 38— and me decided to do a 3,000 lb concrete floor piece we were very excited to leave the walls blank and exhibit them… and in the end we kind of felt they got erased: Ludlow 38 appeared much bigger, literally, metaphorically. So yes, both shows disrupt and re-negotiate something. You work in a huge expanse of mediums (…even music? )— yet your trajectory loops into a conversation that critically seems most compelling when your work is specific to place. What and how do you see the levels of social engagement change when working between and within these ephemeral environments and situations? Is the temporality of their experience what interests you to continue making work in this format? So I’ve been always interested in the relationships between recipient and object, their context and the mechanisms of their display. There are hierarchies and power structures but in the end the viewer generates the value which makes all participating elements arbitrary. At the moment I am working on a six meter long plush sculpture in form of an broken obelisk, shattered on the floor. Quite the opposite of concrete and steel— a giant symbol of power, making space for something new in it’s collapse… availing the positive aspects of destruction and ability to see ‘chance’ even in subjective moments of personal failure. You just left NYC where you were studying as a Fullbright Fellow at Hunter College and are now back in Berlin. What’s next for you? Any upcoming spatial evocations or California dreams on the horizon? In September my second solo show at Gillmeier Rech opens in Berlin. We started to work together after my graduation from Städelschule in 2013 which was almost the same time Verena Gillmeier and Claudia Rech decided to open the gallery. Growing together is a great advantage and I feel very blessed to be in their cloud. We’re also working on a project in LA which would give me the opportunity to come back end of the year and realize a three meter high iron gate depicting the outlines of two open hands. NYC is a great place for my work, but I feel the urge to spend a longer period of time in LA as well. Songs of Convenience & Melancholy on view by appointment at Bad Reputation (Westlake / MacArthur Park) thru Friday, August 28th. Also make the traffic-trek… and don’t miss a show that induces a cognitive state through the interplay and associations born from the phenomena of linking new technologies: light, sound, and video. 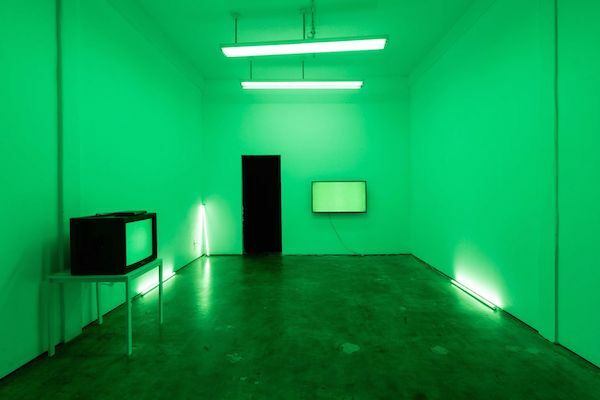 1997/2013, an installation featuring two video works, colored light and a soundscape by Vienna based artists Richard Hoeck and Heimo Zobernig. Closing at Meliksetian | Briggs (WeHo) this Saturday, August 22nd. Open Thursday–Saturday 12-5pm. Navigate all the must-see art events online.